In a recent post I showed how I created “Urban Sunset”–a repeat design for a fabric design contest. I really liked the design and thought I’d try t o create a non-repeating design that I could print on fabric and then turn into a whole cloth quilt. My plan is to create a design that’s about a yard wide so I can have it printed at Spoonflower on a full yard of fabric. Here’s the ‘brick’ brush I created in Photoshop. It’s slightly different from my earlier post in that I cleaned up the edges a bit. I used only this brush in all the designs. Recently Spoonflower and the Textile Center in Minneapolis, MN sponsored a design contest called Urban Sightings. The aim was to design a fabric using, as inspiration, photos taken of the neighborhood around the Textile Center . There were six photos, and I used the five below as my inspiration. Traditional batik designs are created by placing hot wax patterns on fabric, and then dyeing the fabric. The wax resists the dye and keeps the fabric beneath the wax the original color. Dharma Trading has a colorful and fun explanation of creating batiks here. I entered another of Spoonflower’s weekly fabric contests. This one called for a one-yard image that included four distinct coordinating fabric designs, including at least one stripe pattern and one dot pattern. I’m not sure why I enter these contests…but it’s fun working on the designs and I’m learning a lot about Photoshop and Illustrator and repeat pattern design in the process. 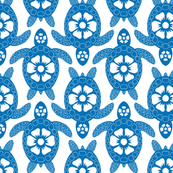 One of Spoonflower’s recent weekly fabric design contests was to design a fabric using a recipe as part of the design. I’m not much of a cook (my husband does most of the cooking, though I’ve mastered the NY Times No-Knead Bread), so I don’t have any go-to recipes. In a previous post I talked about the improvisational approach I took to create a quilt from two silk scarves I bought while on vacation in Kauai. That previous post showed some of the different layouts I’d tried–b oth on the computer and on my design wall–for all the pieces I’d sewn together. The picture on the right shows nearly the final design. Just a few more pieces were added for the final quilt.